MinerBumping.com: Kill Rights, What Are They Good For? "I have kill rights, and I will use them." Those chilling words, uttered by the indispensable Mine Teck, are enough to send a chill down anyone's spine. Anyone, that is, other than the ever-valiant Knights of the Order. Because our Knights operate with a permanent -10 sec status, kill rights are irrelevant; they're shoot-on-sight in highsec no matter what. But that doesn't stop the carebears from threatening to deploy said kill rights. 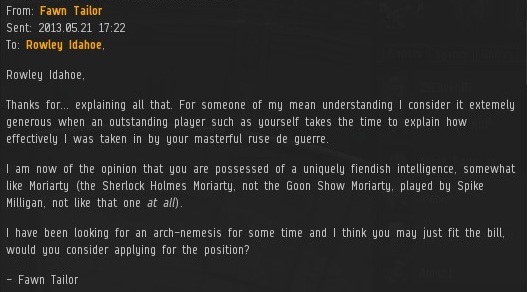 After Agent Fawn Tailor killed some bad guys and sent them EVEmails telling them that they were bad guys, Rowley Idahoe sent this response. Most of it feels like a Miner Bingo mashup, but Rowley concluded the missive by dropping the big "KR". The New Order is not an order of monsters. Fawn graciously stepped down from our ivory tower and offered to teach Rowley about EVE's game mechanics. Surely this singular act of generosity would bridge the gap between Knight and carebear. Rowley issued a stunning reply: It was the "I meant to do that" defense! Rowley was a puppet master all along! Fawn was astounded by Rowley's trickery. The resistance had a new mastermind. Provoked by Fawn's good sportsmanship, Rowley went into great detail about how he was never really ignorant about how kill rights work. 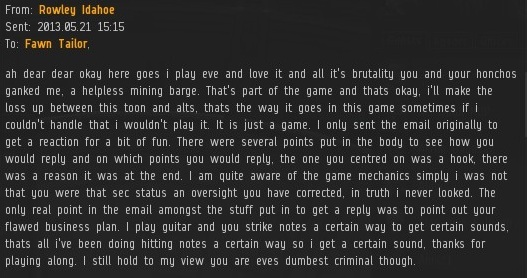 He had written that EVEmail the same way he plays a guitar, or something. How comes the well-spoken, well-informed and good at formatting people end up in the new order while the bad writers, bad mouthers, ill-informed with no sense of humour end up among the rebels? The well-spoken, well-informed people aren't the same ones who make themselves look, or rather, show that they are, retarded and get on minerbumping. Anon 5:42: What? Also, that commas look misplaced. Anon 5 42, well-spoken, well-informed people are the ones that speak well, never smack-talk and say informed things. Easy to spot, really. Q: How comes the well-spoken, well-informed and good at formatting people end up in the new order while the bad writers, bad mouthers, ill-informed with no sense of humour end up among the rebels? A: Because we are Awesome! That spelling... My eyes hurt ! I suppose I should now officially go on record about how much I love Fawn. One of the Order's most eloquent conversationalists. Confirming that Fawn is often the center of attention at New Order Meet-n'-Fleets and dinner parties.